RAF Boulmer, a long-established SAR base in the north-east of the UK, has closed that role as the SAR responsibility for the UK is gradually handed over to Bristow Helicopters. 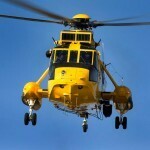 As part of the phased plan to retire Royal Navy and Royal Air Force helicopters, 202 Squadron retired its two yellow Sea Kings with a farewell flight south through the UK on 30th September, ending at HMS Sultan, the Navy base. Established there in 1978, the last SAR operational flight for the “A” Flight of 202 Squadron was on Tuesday 29th, taking a 65-year-old woman who had fallen at Moffat to hospital in Edinburgh. The ferry flight on Wednesday 30th saw Rescue 132 depart Boulmer around 9.45am, followed by Rescue 131 at 11.00am. Winchman Ben Jacobs recorded the route for everyone to see on Twitter which included a low flypast at Humberside Airport – where Bristow now have two Sikorsky S92s operational under the new contract – before a fuel stop at RAF Marham. Flypasts at Lakenheath and Mildenhall followed, then Duxford and a sightseeing tour of central London before reaching its final resting place at HMS Sultan, on the west side of Portsmouth Harbour. The two helicopters involved were XZ586 (Rescue 131) and XZ590 (Rescue 132).